Zurich's tallest 4-star hotel Swissôtel Zurich owns a choice of 347 modern non-smoking rooms and suites with panoramic views of Zurich and the Swiss Alps. The convention centre features 17 function rooms with daylight and offers the expertise to host events for up to 700 guests with a personal Meeting Concierge and creative catering. You'll enjoy a full range of leisure facilities, such as Spa and Sport on the 32th floor and seasonal Swiss dishes in our Le Muh restaurant. The hotel will be undergoing Pool Renovations and the hotel pool will be closed during October 6 to October 12, 2019. 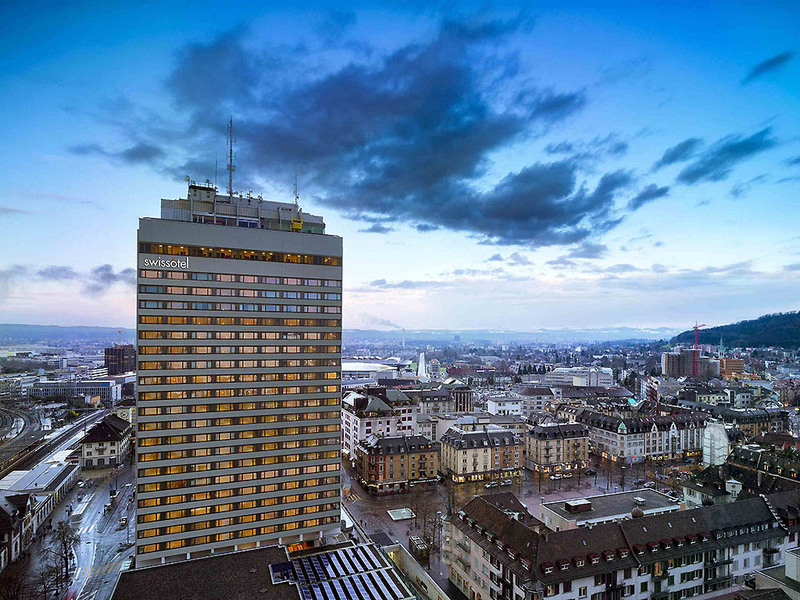 Swissotel Zurich comprises 347 non-smoking rooms on 31 floors equipped with a wealth of amenities. The elegant designed guest rooms and suites serve the demand of frequent travelers and offer a choice of accommodation options. Swissotel Zurich's restaurant serves you Swiss dishes reinterpreted for today's healthy lifestyles, all made using locally sourced ingredients - organic whenever possible. Swissotel's team of top chefs serves your tasty and quick business lunches. Le Muh bar is an excellent place to start the day with a morning coffee. Relaxing outdoor lounges invite for refreshing drinks and in the evenings you are offered a wide range of cocktail creations and a fine selection of fresh draft-beer.